Download/view PDF (2.28 MB) of the full slidedeck. If you do not have one already, sign up for a free Google account. Visit https://www.google.com/accounts/ and select "Create an Account." After you sign up, or if you already have a Google account, login and go to http://reader.google.com/. We'll spend a few minutes now getting to know a few key areas of the primary Google Reader interface. (1) Main Menu. Click on "All items" to begin reading the converging streams of RSS content. Notice, as well, the options to view items you have starred and items you have shared. (2) Item Viewing Area. The right-hand portion of the screen is dedicated to viewing items funneling into your account. 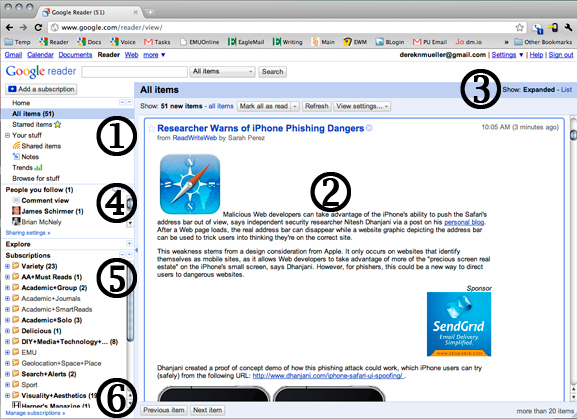 Click on a hyperlink (including the item title) to trace a link back to the page on which it appears on the web. (3) Item Viewing Menu. Toggle between list view and expanded view. With the click of a button, you can also "Mark All As Read." (4) People You Follow. Google Reader allows you to share content with other Google Reader users. That is, when people you follow share items, Google Reader will pick up on them and indicate by number how many new shared items are available. (5) Subscriptions Listing. This area presents a directory of your subscriptions, including the folder structure you have set up. Click on a specific folder, and Area 2 will display only new items from feeds in the specific folder. (6) Manage Subscriptions. An easy-to-overlook link where you can create folders, rename and remove feeds, and adjust settings. Get some practice adding feeds to Google Reader. Visit each of the following five sites (hyperlinked below), and click on the RSS icon in your web browser's address bar. Select "Add to Google Reader." Repeat this process, and you will have subscribed to new content from all five sites. If you have extra time, feel free to search for other RSS feeds related to your teaching and research interests. Other possibilities: Wikipedia, Flickr, Delicious, Google Alerts RSS, YouTube. Search _______ RSS for more. After you have added a handful of feeds to your Google Reader account, begin to explore some of the ways you can navigate the items you have collected. Quick keys (keyboard shortcuts) make navigating Google Reader simpler. For a comprehensive listing of keyboard shortcuts visit Google Reader Help. At this point, you 1) have an active Google Reader account, 2) know how to find and add subscriptions, and 3) know how to use keyboard shortcuts to move from item to item. A fine start! However, if time allows, attempt the following steps. A. Add tags to an RSS feed. In Area 2 (diagram above), look at the menu options at the bottom of a content item. Click on "tags" and add index terms you want to use to categorize the item. For now, the specific terms you choose are less important than gaining familiarity with the process involved. B. Send an item via email. Using the keyboard shortcut 'E' or clicking the "Send to" item in the menu in Area 2 above, you can route an item to any email address. Experiment with this feature by sending an item to your emich.edu account. Include a note to get a feel for how the message will appear in your inbox (or in the inbox of colleagues, collaborators, or students when you send items to them). C. Create a folder. Start by selecting the "Manage subscriptions" link located in Area 6 on the diagram above. When you "Manage subscriptions," you will see the following "Settings" view. Create a folder called "EMU" and associate the appropriate feeds with the folder. When you click "Back to Google Reader," you should see a folder icon called "EMU' in Area 5 above. There is much more to explore under "Manage subscriptions" in due time, but for now the following elements are distinctly important. (7) Settings Menu: Preferences, Subscriptions, Folders and Tags, Goodies, Import/Export, Send To. (8) Subscriptions: A comprehensive listing of the RSS feeds to which you are subscribed. Use this tab to rename feeds, to delete feeds, to create folders, or to reassign a feed item to a different folder. 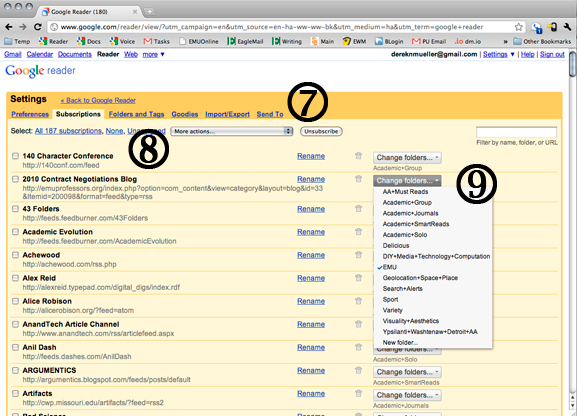 (9) Change Folders Menu: Use this drop-down menu to create folders or to reassign a feed item to a different folder. Over time, you should feel free to add and remove subscriptions as you decide best fits your aims. It is difficult to say; reading (whether analog or digital texts) is not a one-size-fits-all proposition. I currently subscribe to 185 feeds, but many of them are tied to blogs whose purveyors update infrequently. If you subscribe to too many feeds too early or if you are apprehensive about "Mark[ing] All as Read" when the account gets too full to sort through, the practice will seem to you unsustainable. So it is key for more methodical adoptions of Google Reader that users adopt and fine-tune sustainable practices. Learn where the feeds are for your teaching and research interests. There are many feeds for listservs, CFP clearinghouses/blogs, online journals, and blogs kept by colleagues at other institutions. For the last 15 minutes of our workshop, let's discuss the following questions. Q. What are some remaining technical or functional questions you have? Q. What are some surprises and discoveries you made during today's workshop? Q. What ideas do you have for integrating Google Reader into your teaching? 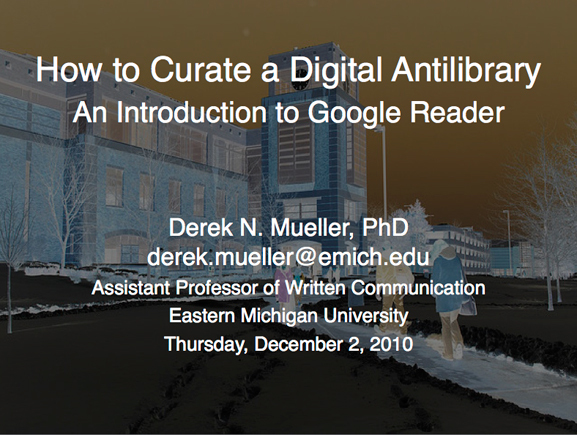 Please follow-up with me at derek.mueller@emich.edu if you would like to continue the conversation about Google Reader.